For the last few decades, tourism has undergone remarkable growth, making significant contribution to the local and national economy. Tourism accounts for 10 per cent of the global GDP, creating 1 in every 10 jobs in the world. Every year, millions of tourists flock to various tourist attractions such as historical sites, museums and coastlines, bringing income and jobs to local communities. In addition, given the fact that more and more people seek for undisturbed nature and authentic experiences, local resources can be a valuable asset for tourism development. The trend of ecotourism has been consistently gaining attention since the mid-20th century, which now represents an estimated 11.4% of all tourism consumers spending. Ecotourism is significant as it not only requires effort to preserve the environment and local culture from travel industry and community’s side, but also socially responsible attitude from the tourist’s side. As UNWTO’s Global Code of Ethics for Tourism (GCET) states, it is possible to achieve both the maximization of benefits as well as minimization of negative impact on the environment. Along with the UN designation of 2017 as the International Year of Sustainable Tourism for Development, the public interest in ecotourism is higher than ever. 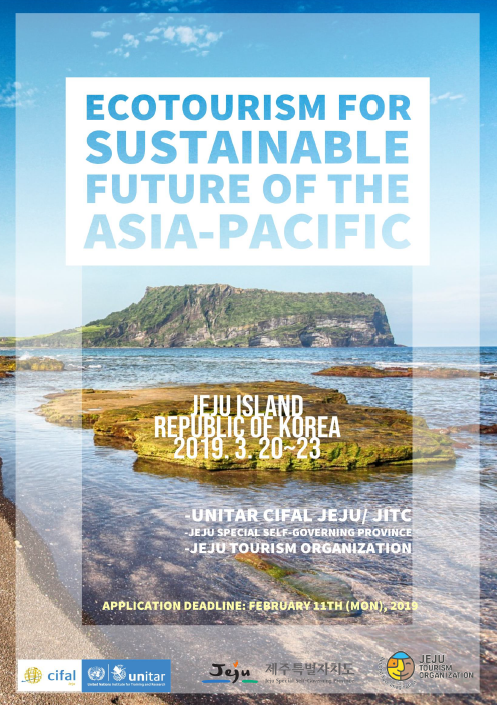 Ecotourism bears particular meaning within the Asia-Pacific context, as there has been increasing demand for diverse tourist activities involving nature and cultural immersion. Moreover, Asia-Pacific tourism market has high potential as the global GDP share of the Asia-Pacific is now at 42%. Relevant concepts such as Community-Based Tourism and Justice Tourism are also gaining popularity in the Asia-Pacific due to its abundance of natural resources, diversity of small-scale communities, and effort to close high income gap. · Offer a venue for knowledge sharing and discussion and motivate participants to implement ecotourism policies, with particular focus on UN SDGs. · Coordinate partnerships to effectively promote the benefits of ecotourism with civil societies, government and local entrepreneurs. · Certificate UNITAR and UNITAR CIFAL Jeju/JITC will jointly issue a certificate upon the completion of the training. *Additionally, Participants are required to bring a personal laptop. We will be launching an online CityShare Platform in March which will involve high laptop usage.